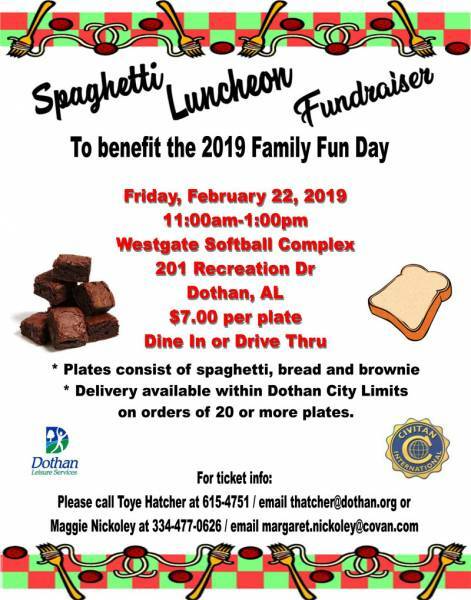 Dothan Leisure Services and Dothan Civitan Club are teaming up to sponsor a spaghetti fundraiser on Friday, February 22, 2019 from 11:00 a.m. – 1:00 p.m. at Westgate Softball Complex (201 Recreation Drive). Funds will benefit the annual Family Fun Day (a day for special needs individuals and their families). Plates are $7.00 each and dine-in or carry out will be available. Delivery will be available within the Dothan City limits on orders of 20 or more plates. Included on the plate will be spaghetti with meat sauce, bread, and a brownie. For ticket information please contact Toye Hatcher 334-615-4751 or email thatcher@dothan.org or contact Maggie Nickoley at 334-477-0626 or email margaret.nickoley@covan.com.